OBJECTIVE: In order to diagnose pancreaticobiliary maljunction (PBM) appropriately, direct fluoroscopic examinations of the biliary tract system is necessary. However, for patients without symptoms, these examinations are performed only in selected cases. 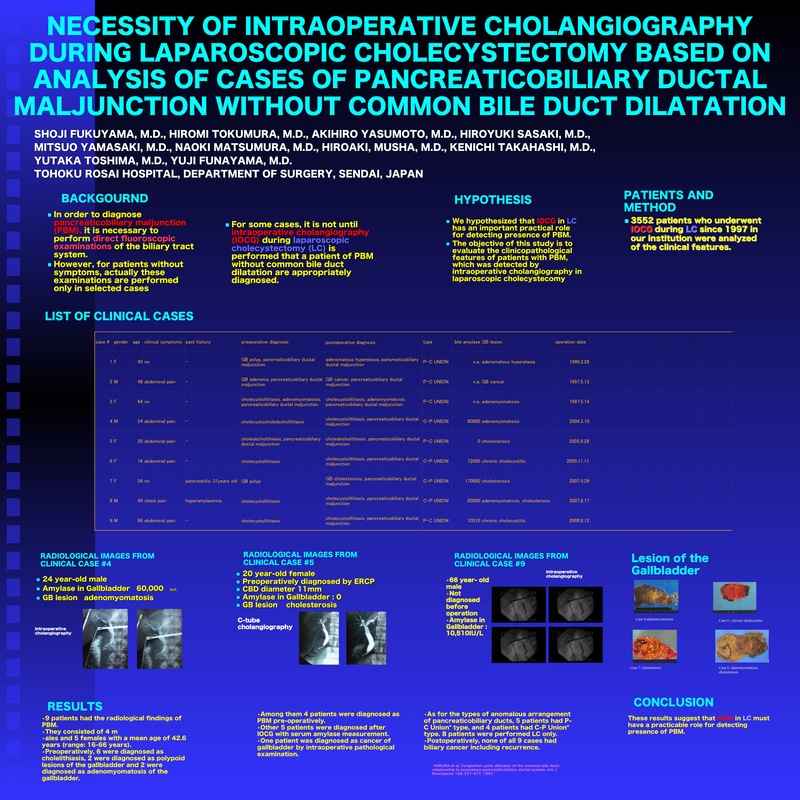 For some cases, it is not until intraoperative cholangiography (IOCG) during laparoscopic cholecystectomy (LC) is performed that a patient of PBM without common bile duct dilatation are diagnosed. We hypothesized that IOCG in LC has an important role for detecting presence of PBM. METHODS: 3552 patients who underwent IOCG during LC since 1997 in our institution were analyzed of the clinical features. RESULT: 9 patients had the radiological findings of PBM without common bile duct dilatation. They consisted of 4 males and 5 females with a mean age of 42.6 years (range: 16-66 years). Preoperatively, 6 were diagnosed as cholelithiasis, 2 were diagnosed as polypoid lesions of the gallbladder and 2 were diagnosed as adenomyomatosis of the gallbladder. Among them 4 patients were diagnosed as PBM preoperatively. And other 5 patients were diagnosed after IOCG with serum amylase measurement. And one patient was diagnosed as cancer of gallbladder by intraoperative pathological examination. As for the types of anomalous arrangement of pancreaticobiliary ducts, 5 patients had P-C Union type, and 4 patients had C-P Union type. 8 patients were performed LC only. Postoperatively, none of all 9 cases had biliary cancer including recurrence. CONCLUSION: These results suggest that IOCG in LC must have a practicable role for detecting presence of PBM without common bile duct dilatation.